Thanks to @cerigg for this art piece! The Mighty Nein accepted two missions involving the Gear Hold Prison in Hupperdook. We’ll break down what they are and the moving pieces to keep in mind. Mission 1: Destroy Clef Tinkertop’s malfunctioning automaton. Mission 2: Break Glinda and Wallace Schuster out of prison. Thanks to @OrcBarbies for this art piece! The Nein got involved in this mission firstly because Rissa was out of a job and spotted the travelers on their way into Hupperdook. Upon entering the Blushing Tankard Tavern, Rissa was bullied by two punk gnomes, Fitz and Ashton. They brought up her lack of employment, but also her father’s experimental tinkering. 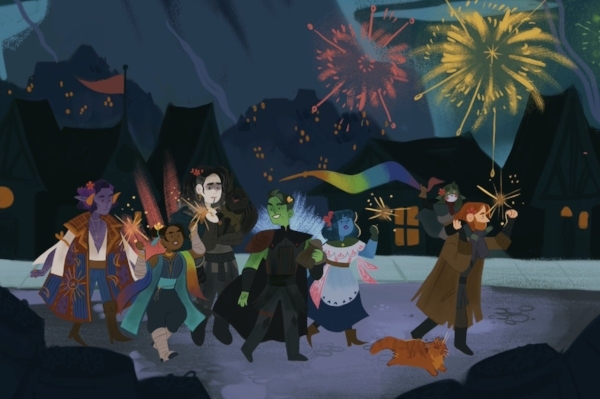 After a night of debauchery, TM9 woke up to all of their coin purses gone (save Jester and Yasha, who didn’t participate in the group drinking competition, The Hour of Power). Determined to find their stolen cash and bring the perpetrators to justice, they set off to find Fitz and Ashton, and stopped along the way at Rissa’s father’s shop, Tinkertop Inventions. Clef, a kindly old gnome, demonstrated one of his inventions, an enchanted clockwork crossbow worth 2000 gold. He also detailed to them how he fell out of favor with the local government. He was commissioned by the Wardens of the Gear Hold Prison to make a clockwork warden. Despite his testing and confidence in its abilities, it malfunctioned in its first use. Instead of just going after the Wardens’ intended targets, it attacked without consideration for what was in front of it. From how Clef described it, it’s possible that it resulted in death and injury for those present. As a result, the clockwork warden was sealed away to prevent it from attacking anyone else, and Clef was issued a fine. He and Rissa are still bullied by some of the Hupperdook residents about it. The Mighty Nein agreed to get into the prison and destroy the clockwork warden in exchange for the crossbow. In order to get into the prison, they’ll have to get permission from the Wardens running it first. They’re essentially offering to do the Wardens and Clef a favor, so it’s a win-win situation all around, assuming they’re successful. Thanks to @Andy_Allan_Poe for this art piece! After their visit to Tinkertop’s Inventions, TM9 paid a visit to Ashton and Fitz’s employer, Steelbringer’s Forge. After intimidating them, their employer was paid to let them play detective for the day to find out who stole the Nein’s money. Soon after, Jester’s Locate Object spell found its target, and The Mighty Nein broke into a boarded-up butcher shop. There, they found their money, and four children: Gail, Austin, Jude, and Layla Schuster. 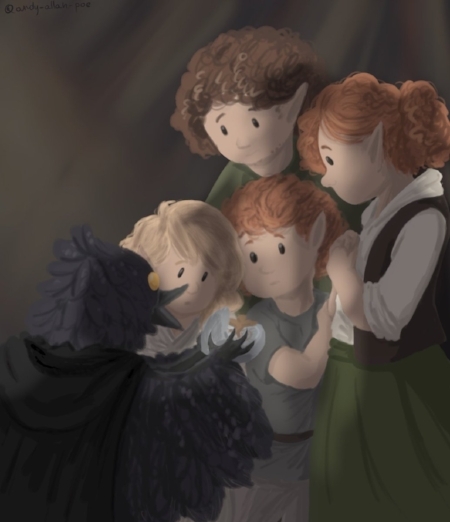 The kids have been on their own for the last six months after their parents, Gilda and Wallace were thrown in the Gear Hold during the Tithe Collector’s biannual visit due to their worship of the Changebringer. The kids have been scraping by by stealing what they can. Hupperdook residents out to party every night don’t carry much coin on them, so stealing from TM9 was a terrifying boon. For their honesty and thieving talent, Beau gave the kids 20 gold. The looming visit of the Tithe Collectors brings with it the prospect of the kids getting taken to Rexxentrum and put in an orphanage, which the Schusters aren’t interested in. Fjord, revealing that he had previously lived in an orphanage, wants to give these kids a chance at being reunited with their parents, so TM9 agrees to try to break Gilda and Wallace out. There are several complicating factors in Mission 2. The Mighty Nein have never been in this prison, nor are they familiar with the operating structure of the Wardens, or the cells, or where the Schusters might be housed. They’ve also never met the Schuster parents, and didn’t get a physical description for them. Setting them loose without going through official channels would make them fugitives from the law, and even if they could get out of town with four children in tow, it’s hard for a group of six to hide and move quickly. The penalty for breaking out of prison is likely much steeper than idol worship. Ashton and Fitz are currently out looking for those who stole TM9’s money, and haven’t been informed that their services are no longer required. So long as they continue to be ineffective and don’t involve the Crownsguard, there’s no reason for concern. Since the Nein got to the kids first, their coin purses have been returned and there is no evidence of the Schusters’ thievery at the butcher shop any more. Finally, should The Mighty Nein be witnessed aiding Gilda and Wallace in their prison break, they will become personae non gratae within the Empire, and will largely ruin their travel plans because they will potentially be put in jail. If they manage to escape, they’ll officially be on the run from the law while still several days out from Shadycreek Run. They would lose their favored status in Zadash. Further, The Mighty Nein carries on them symbols of several outlawed deities (The Traveler, Moonweaver, Stormlord), and one of their members is a goblin. They also carry the Beacon (the dodecahedron), an artifact previously locked away in the Zauber Spire in Zadash that the Cerberus Assembly is surely unhappy to have lost. Even further, should they get thrown in prison, there’s always the possibility of Caleb having his necklace taken from him, rendering him suddenly findable by Trent Ikithon and his people. In short, the risk involved in Mission 2 is significantly higher than defeating a destructive automaton in Mission 1.